solar-powered with battery backup prevents memory loss. advanced feature allows you to recall data even if the unit is turned off. verifies new answer against previous answer. 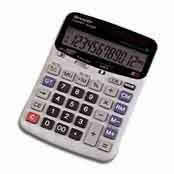 automatic tax calculations, days and date calculation, double zero key, 2-key rollover, float (F) and fixed (3,2,1,0) decimal, add mode selector, 2-position kickstand, solar cell and lithium battery, and automatic power-off. This page is part of GeneralManual.Com Network SHARP VX-2128R Commercial Calculator User Manual.